﻿ Organiser - How long 'We the People' be fooled by the Fraud Dynasty? Organiser - How long 'We the People' be fooled by the Fraud Dynasty? How long 'We the People' be fooled by the Fraud Dynasty? 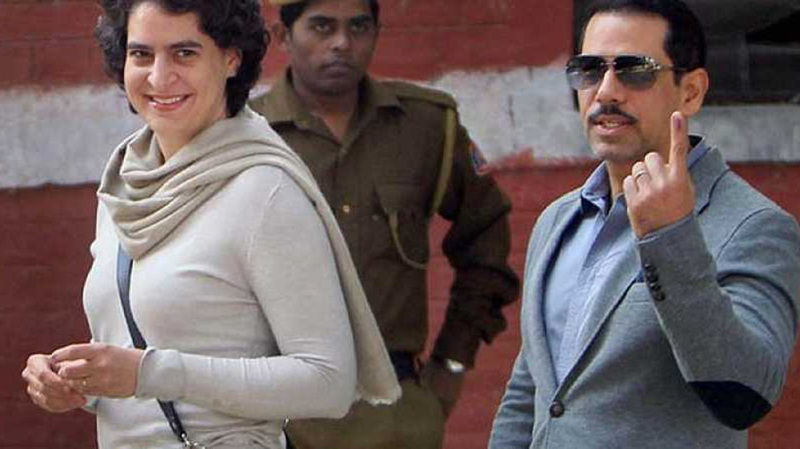 Robert Vadra (RV), Son-in-Law of Sonia Ghandy, and husband of Priyanka Ghandy, got ‘interim protection’ from arrest till February 16, 2019, in money laundering case from Delhi Patiala Court. Political Vendetta was the hoarse cry of all the cronies of the “Fraudsters Dynasty of Ghandy”. In retrospect, fashion it is today for spokespersons of ‘political big chors’ to invoke “political vendetta”. So, they want to remain above the ‘laws of the land’ for perpetuity. What a shame that India claims to be enlightened civilisation under cover of “Ashoka Chakra” in the National Flag symbolising the law of dharma. Truth or Satya, Dharma or virtue ought to be the controlling principle of those who work under this flag”. Instead, what is disgusting and disheartening is the majority of them are ‘congenital liars and fraudsters’ looting and scooting the country. How long “We the People” be fooled by the Fraud Dynasty? Robert Vadra allegedly has committed the fraud of money laundering in the purchase of a London-based property – located at 12, Brynston Square – worth 1.9 million pounds (Rs. 17,77,41,336). As per media reports, the property was bought by Bhandari for GBP 1.9 million and sold in 2010 for the same despite incurring additional expenses of approximately GBP 65,900 on its renovation confirming that the property was owned by Vadra. On Jan 19, the Enforcement Directorate told the court that Arora was cooperating in the probe. In the past, Arora had alleged before the court that the case was foisted on him by the NDA govt out of “Political Vendetta”. Who is Arora? He is an employee of Vadra’s Skylight Hospitality LLP, and a key person who was aware of Vadra’s overseas undeclared assets and was instrumental in arranging funds. If there is anyone who should clear his name from acquiring “Disproportionate Assets” beyond the known income sources, it is RV. Let none nurture any illusions on the above count. How can a “Brassware dealer” of Janpath become a billionaire without indulging in illegal business transactions either in land deals or sale of precious antiques to foreign nations? Let me highlight the “Rags to Riches Story” of RV. RV was born on 18 April 1969 to Rajendra and Maureen who was of Scottish origin (her maiden name was McDonagh). Rajendra’s family was originally from Sialkot, Pakistan. His father migrated from Sialkot, Pakistan at the time of partition and took up residence in Civil Lines area of Moradabad and ran a brass and wood handicrafts business. Ipso facto, RVs family business started from a small company called Artex, specialising in artificial jewellery and handicraft exports. Rajinder separated from his wife, Maureen, is an exporter of metal handicrafts and operates from Amar Colony. RV had two siblings, Richard and Michelle. While RV was the proprietor of Artex Exports, through which he sold costume jewellery. Richard ran an independent export business. Robert's sister Michelle died in a car accident in April 2001. RV married Priyanka Ghandy in 1997. Vadra’s father had "expressed displeasure" with RV's marriage with Priyanka Ghandy. RV issued a public notice in 2001, stating that his father, Rajender, and brother, Richard, were "duping" people by promising jobs at the Uttar Pradesh Congress Committee and other favours. Rajendra threatened to file a defamation suit against his son. In January 2002, Robert Vadra placed ads in newspapers, declaring that he had nothing to do with his father, Rajinder, and brother, Richard, and that any attempts by them to gain favours by pretending to act on his behalf should be disregarded. The Congress directed all its CMs, PCC bosses and CLP leaders to let it be known to "one and all" that Robert Vadra had severed ties with his father and brother, and "no favour sought by them in Robert's name should be entertained." In 2003, Richard Vadra, estranged brother of RV, reportedly committed suicide in Moradabad. Rajendra Vadra, reportedly died of a heart attack in 2009 although police officials had reported that Rajendra allegedly committed suicide by hanging himself in Room Number 6 of a guesthouse in Yusuf Sarai. As per data available in public domain, within a span of 5-6 years, the RVs small time business grew into conglomerate/empire. If RV has done through fair means, it will be a fit case for “case study’ in global reputed MBA institutions. RV business conglomerate includes: Sky Light Hospitality Pvt Ltd (owned by Vadra and his mother Maureen Vadra), which is a partner in a firm that owns Hilton Garden Inn in the South Delhi business district Saket; Blue Breeze Trading Pvt Ltd (aircraft chartering) with 4 aircraft; North India IT Parks Pvt Ltd; Real Earth Estates Pvt Ltd; and Sky Light Realty Pvt Ltd. As per latest media reports, there are another six companies registered by him. RV’s entry into the real estate business was accompanied by a partnership with the country’s largest realty firm, DLF Ltd, a staggering feat by any standards (The Economic Times, 14 March 2011). RV quietly switched lanes in 2008, buying up land in Haryana and Rajasthan, a 50% stake in a leading business hotel in Delhi, and attempting to enter the business of chartering aircraft, a quantum jump that certainly merits an explanation. The method adopted to rise from ‘rags to riches’ appear simple. RV received unsecured loans, free of interest, from DLF Limited, which was used by him to buy back properties grossly undervalued from the DLF. Thus, Vadra’s receipt of unsecured loans certainly merits a probe. - As on March 2009, Sky Light Hospitality had received unsecured loans amounting to Rs 25 crore from DLF Ltd.
- As on March 2010, only Rs 10 crore remained. It was unclear from the statement of accounts if the rest was paid back or written off. - Sky Light Hospitality in turn loaned money to other Vadra-owned companies such as Blue Breeze Trading Pvt. Ltd, North India IT Parks Pvt. Ltd, Real Earth Estates Pvt. Ltd and Sky Light Realty Pvt. Ltd.
As per DLF spokespersons, all deals have been reflected in their books. However, what remains unanswered by DLF is simple. How can a company with thousands of crores of loans outstanding to banks and other financial institutions give unsecured loans free of interest? It should baffle every one. RV sob story is simple. Having lost his beloved ones, he is prepared to face the charges and prove himself above board in his business dealings with the DLF and others. It is learnt that when an official of Sri Padmavathi Guest House approached him for a signature mandated for non-Hindus, RV said that he is not a Christian. “My father is a Punjabi and my mother is a Christian. I am a Hindu and in my last visit too I have not signed and this time also, I am not going to sign the temple’s entry register,’’ he reportedly said. Viewed from the “rags to riches” raise, disowning his father and siblings and his latest “Hindu” avatar, RV can be classified as opportunistic chameleon changing colours and religions to somehow escape the punishment of high-level corruption allegations against him. Surely, RV must not be allowed to escape from the “Laws of the Land” like others have done in the past.